It wasnt the best of mornings, I had gone to bed with a terrible bout of cold and woke up with some of this not having dissipated from my body. I was very sluggish and must have laid in bed for an extra one hour before i summoned the courage to drag my feets to the kitchen for a cup of hot tea and bread and fried eggs as compliments. I looked at the clock, it was way past 10 and sure knew that going to church on this holiest of all days was not going to be possible. I lay down on the bed again, grabbed the copy of “In God’s Name” by David Yallop, a novel that I had been reading for almost a week. The plot was thickening and I didn’t want to miss anything about the conspiracy of Calvi, Sidonna and Marcinkus – any of whom may well end up being the one responsible for the death of Albino Luciani. Luciani was Pope John Paul 1. This went on for another two (2) hours and finally I remembered my commitment, to visit the Nike Art Gallery. I had made two previous trips to the gallery and on each of the occasions did not wander past the ground floor. Something in me had been telling me that there was much to learn in the gallery, after all collecting arts is a passion that I want to turn into a business. I made it to the bath tub and then to my wardrobe. I settled on a very colorful shirt from Vanuatu and armed with my cellphone, laptop and some Naira notes, I made my way out of my abode. Well, I got to the gallery and was alighting from my car when my phone rang. It was from my little brother and the discussion was that my attention was needed somewhere else. This was not the plan but when he calls, I needed to leave and off to where he was I went. An hour later, I was able to achieve my escape and drove back to the gallery. At the entrance to the gallery stood Chief Nike Okundaiye – simple, yet sophisticated. She is art personified, in fact deified. She was wearing an Adire, as if anyone would ever find her in anything else! With hair barbed very low, she looks much younger than her age. There she was, attending to clients in her newly opened café, an addition to the Art Gallery. I got in through the massive doors and was accosted with the gleaming white paints enhanced by the various works of art that were hung on the walls, laid on the floor by the walls as well as arranged in beautiful symmetry on the tables. I introduced myself to the lady occupying the receptionist seat and soon made my way away from her desk to the walls of the gallery. 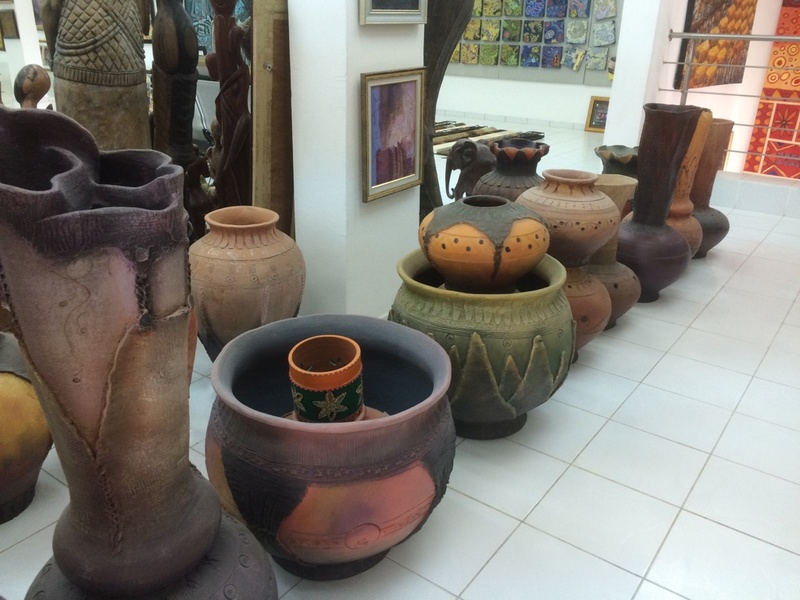 I was simply stunned, elated, surprised with the teeming works of many a Nigerian Artists, all dotting the space with their arrays of colours, mixture of art forms and diversity in materials selection. 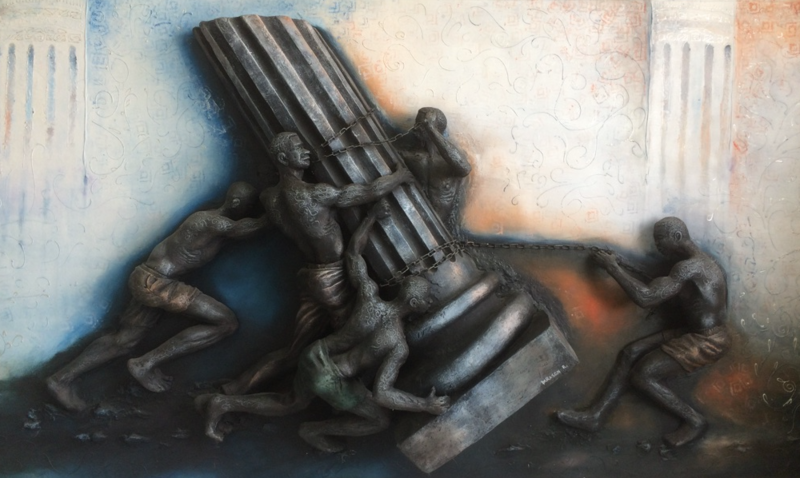 Kunle Adegborioye – an impressive artist born on April 20, 1966 in Ibadan, the cosmopolitan Yoruba city set on seven hills. He has an Afrocentric world view and his political leanings and ideology are well reflected in the arrays of paintings he has on display at Nike Art Gallery. His works are also available on bohams.com and invaluable.com, the world’s premier auction sites for artworks. He lives and works in London. He also had on display a Map of Africa made out of fabric with the Madiba, Nelson Mandela, depicted. Oyerinde Olotu – I was taken in by the oil on canvas paint of the Nigerian Prime Minister (Sir Abubakar Tafawa Balewa) conversing with the Duchess of Kent on the grounds of the State House Gardens Marina in 1960. It was a minute of history that got frozen in time and was well captured by this artist. This work summarises the speciality of the artist – capturing, in paint, old things and events. Oyerinde was born in 1959 and as such must be a tiny little baby in his mother’s arms when the Duchess came visiting. 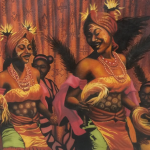 Emenike Ogwo – An accomplished painter and a documentary artist, born in Abia state of Nigeria. 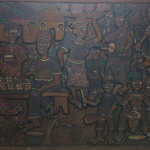 His artworks have Terra Kulture and is a mix of different media. He is a versatile artist in terms of his paintings that are currently exhibited at Nike Art Gallery. where Chief Nike Okundaiye comes from. There must be something in the waters of Ogidi that made these people exceptional Artists. He was an accomplished painter, sculptor and musician. His work titled “Festival of Age Mate” is inspiring and will catch the attention of any art lover, as displayed in the gallery. One will also come across the painting of the current President of Nigeria, Goodluck Ebele Jonathan, done by Owolabi Ayodele. I wonder why the President has not sent for the procurement of this work. It has the President, deep in thought with an expression that seems to convey he has found a solution to the myriad of problems that ails the nation. 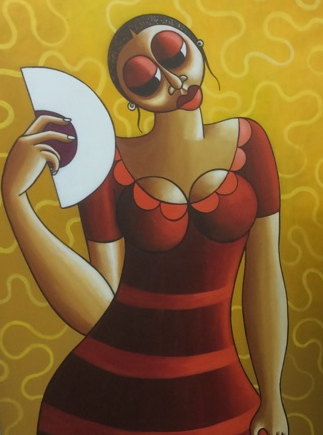 It will be unfair not to mention the creative works by Adeola Balogun. 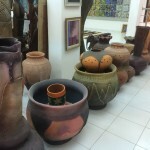 A lecturer in the Fine Art Department of the Yaba College of Technology, an institution that has the unique record of producing the finest and best of Nigerian Artists. His work was with a mixture of materials – Car Tyres, Bottle Covers, Fan Grill and items that others would have considered a junk. He creatively recycles them to produce masterpieces of art. 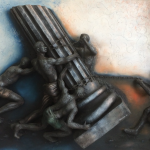 There were other works by Tola Wewe, born in 1959 and with a 1983 fine art degree from the, then, University of Ife. 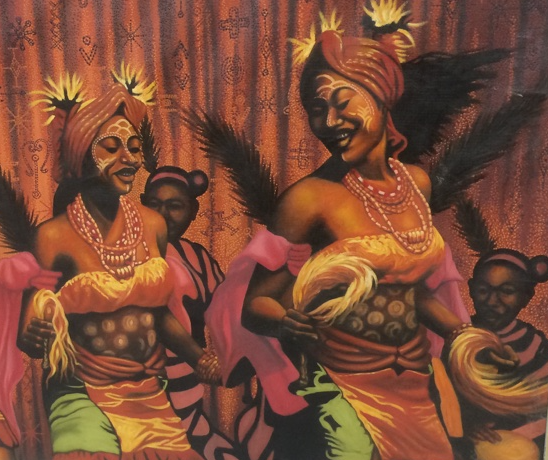 So also are there works by Owolabi Ayodele, Joereal Emeh Okwun, Abdulrazaq Ahmed and Prince Eze. 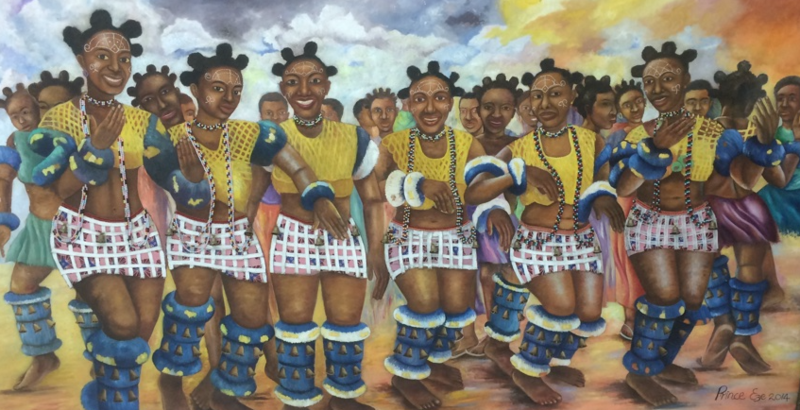 The 2014 work titled “Maidens” by Prince Eze is worth a special mention. 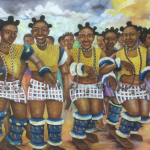 In this beautiful piece, you have Calabar or Ibibio Maidens replete in the traditional skimpy skirts and half tops expressed in a dance. You will leave this painting with many things being suggested to your poor soul. 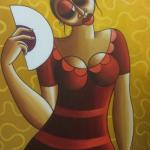 There was also Toluwalase Aliki, an artist that must have deeply fallen in love with circles, arcs and bright and captivating colors. As I looked at his artworks, I can see over and over again the scintillating shapes of our female folks well expressed all over and none of us men. There it was, he must be a sexist, of the type my daughter always scream at me over. By the time I relieved myself from the captive strengths of these various paintings and made it to the fourth (4th) floor of the gallery, I was accosted by the work of that artist – Darasen R. Using a mixture of materials, he depicted five able bodied men determined to right a falling pillar and place it firmly on its foundations again. I was soon deep in thought and recognized this Artist as a prophet. If this were biblical times, he will be regarded similar to Jeremy the prophet. His work spoke to me. It telss me of a rebuilding that my nation, Nigeria, is going to witness. Without a word, it says the art of rebuilding the nation will take the efforts of all and sundry. It says, Nigeria will rise again. It will take the toils and sweat of Nigerians but the fallen pillars of our nation will be placed on their firm foundation again. I approached Nike for a price to take this particular artwork home. Her answer? It was in the millions of Naira and no, you are wrong, the price is more than just a few millions. I was dejected. She was helpful, if I can come up with somewhat of a meaningful price around the range she had mentioned, she can help to talk to the artist to come down on his price. It was almost a little less than two hours, after I walked into the gallery that I eventually stepped out. There I met a team, visiting from Abuja. There were four foreigners and a Nigerian in the team. We exchanged pleasantries. Given that the gallery is open to all and currently does not charge an entry fee, no one in Lagos and its environ should complain of boredom ever again. There is a lot to see and do in Lagos. A visit to Nike Arts Gallery will do any soul, a lot of good. I do recommend it and guarantee that you will have a great day there.